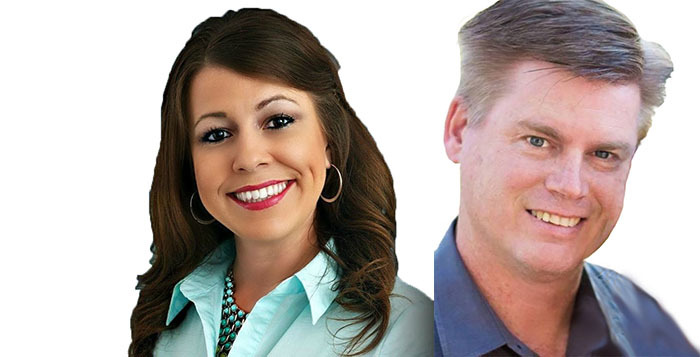 Amanda Stanford and Scott McKee are vying for the Republican nomination for clerk of Superior Court. No other party has a candidate. In charge of Pinal County Superior Court records, including juror lists, the clerk of the court is responsible for the organization and knowledge of the state’s public records law. Both candidates running for the office claim integrity and efficiency. They are also both Republican. Incumbent Amanda Stanford was first elected in 2014. She opened offices in Maricopa and San Tan Valley in an attempt at more convenience for residents. An accountant by trade, she is a certified trainer for Arizona counties in Minimum Accounting Standards and has proposed more modern procedures for the clerk’s office. But opposition to Stanford has been heated from the beginning from some Republicans. Within a year, her office was embroiled in controversy enhanced by uncorroborated personal gossip within the party. Publicly, she accused then-County Attorney Lando Voyle’s office of causing “several hundred” security breaches in court files, an accusation that caused a rift between the two offices. An audit by the Administrative Office of the Courts later determined there had been instances of unauthorized access to files, though fewer than implied. She has worked in the clerk’s office for 10 years and is working toward completion of the Certified Court Executive Program. She has three children. Challenging Stanford in the Republican primary is political newcomer Scott McKee, a financial manager who lives in San Tan Valley. He wants to exceed the minimum standards of efficiency and take full advantage of the Civil Case E-Filing program. McKee has no background with either the clerk’s office or Stanford personally, but was asked to run by other Republicans. McKee is married with six children. Whoever wins the primary will face no opposition in the general election unless a write-in candidate joins the fray. This item appears in part in the August issue of InMaricopa.